Showcase Your Restaurant or Pub in a Google Street View Virtual Tour! When diners choose a restaurant for an everyday meal or a special occasion, the restaurant’s ambiance and decor are important to their decision. By bringing cutting-edge “Street View” technology into eateries, Google has revolutionized the marketing of restaurants, cafes, bars, and even your neighborhood “pub and grill.” When making a decision, diners can “See inside” and take a virtual tour on Google Search results, Google Maps, the restaurant’s website, and even its Facebook page! 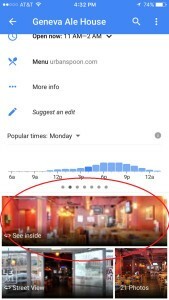 The Google Maps for mobile app is the most widely used smartphone app in the world, and now users in your vicinity can check out the inside of your restaurant right on their mobile device–at the very moment they are nearby and deciding where to dine! Let your customers “See inside” your restaurant or bar with a Google Street View Virtual Tour! “See inside” on Google Search! “See inside” on Google Maps! 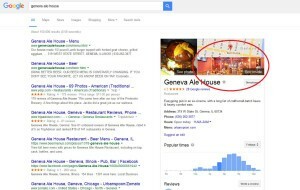 Showcase your restaurant or bar’s unique style and atmosphere on Google Search, Google Maps, your website and social media pages. 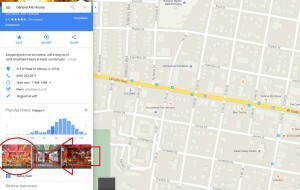 Engage new customers on Google Maps for Mobile when they are nearby and looking for a great place to dine or drink! Smartphone users can “See inside” your restaurant and experience your unique ambiance and decor. Stand out from your competitors by using the latest fun, interactive Google technology to “wow” your customers with incredible 360-degree views of your establishment. 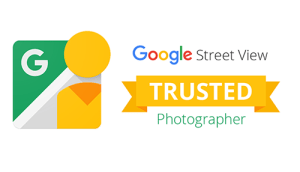 Google Street View virtual tours help Double Interest in Business Listings! Those who view a listing with a virtual tour are twice as likely to be interested in booking a reservation there. Easily embed your virtual tour on your website and Facebook page to showcase your restaurant or pub.